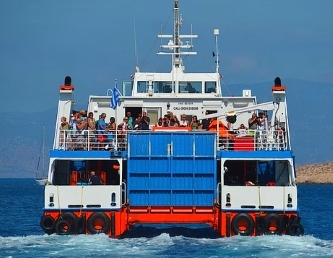 Athens: There are at least 2 ferries a day between Athens and Iraklio, 1 daily to Chania. The ferries from Piraeus (port of Athens) to Rethymnon and Agios Nikolaos do not sail anymore. Most ferries leave in the evening between 9 and 10 pm, arriving early the next day between 6-7pm in Piraeus or Crete. A normal night ferry costs €35and 45 for a deck seat, whilst the faster ferries can go up to €55. If you take a cabin it is more expensive. There are cabins for up to 4 people you can share. Most expensive is a single cabin (about 120 Euro one way). Anek Lines and Linoan Lines both sail daily to and from Crete to Piraeus. Only in high saison there are extra connections during the day. Cyclades: Crete also has connections to other Greek islands by ferry. There’s one or two daily catamaran in the summer (April – October) every morning at around 9am sailing from Iraklio to Santorini, Ios, Paros, Naxos and Mykonos. After arriving in Mykonos, the ferry sails back to Iraklio, arriving at about 7pm. It’s a very fast, expensive ferry – one way to Santorini costs about €40 to 50, and more to Mykonos. The 100km/h ferry has no room for cars or motorbikes. There is a slower ferry which goes from Sitia and Iraklio to Santorini then on to Milos, which is three times cheaper – but three times slower. This ferry also transports cars, and sometimes stops over in Iraklio. In winter these unfrequent connections are the only ferries between Crte and Santorini. Then most people take an airplane. Dodecanese: Leaving from Sitia (and less frequently from Iraklio) there is an big ferry to Rhodes which also stops off in Kasos and Karpathos. The boat is dirt cheap at about €25 for the 10-12 hour journey all the way to Rhodes. Gavdos: Gavdos, the southernmost point of Europe with a permanent population of only 30, is served by 4-5 ferries a week in summer. Three of them leave from Chora Sfakia, the others from Paleochora. You can buy tickets from the port and many travel agencies without hidden charges (circa €12 one way). Only in the high season do these ferries get booked out, so you should try to buy the tickets a few days in advance to guarantee your seat. From Europe by Ferry to Crete: From Britain the best option is to drive or take a bus or train to Italy. You can then take a ferry from Italy to Greece via Venice, Trieste, Ancona, Bari or Brindisi to Patras on the Peloponnese, 230 km from Athens. If you have an Interail or Eurorail ticket, you can use this on some routes, paying only the port tax. Alternatively, you could drive overland via Eastern Europe – a long, but potentially interesting adventure. The National Road: The National Road is the main road of Crete, winding along the north coast. In some parts it’s four lanes wide. This arterial road links all the main towns along the north coast, and there’s no equivalent on the south coast. Often it is better to use the National Highway to get somewhere on the south, since it’ll be quicker – especially in the extremely mountainous areas of Chora Sfakia and Paleochora. There are ferries which substitute for the lack of roads there. The National Road is also called "New Road" one Crete. There is no railway on Crete. 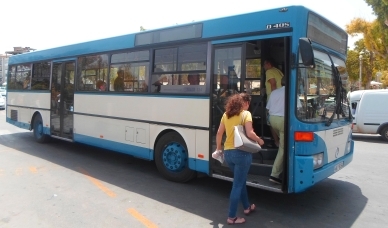 Almost all public transport is from the state-run KTEL bus company. The buses are fast, inexpensive, modern and reliable. On the main routes there are up to two or three buses an hour, and on others, only one or two buses a day. There are more buses a day in summer than in winter. It’s a cheap way to get around; you can travel 100km for only €8. In towns with bus stations, you can buy tickets at the station. Otherwise, you purchase them from the bus conductor or the driver. Big luggage is stored in compartments at the bottom of the bus. If you’re out of town, you can flag down buses sometimes by waving, but it’s generally safer to find a bus stop. The buses do not have toilets and some journeys can last two hours. Smoking is forbidden, but the drivers frequently ignore this rule. This does not, however, mean you too can flaunt the no smoking signs! Always do as the driver and conductor tell you, as they are the bosses and demand your respect accordingly. No hotel on Crete yet? There are thousands hotels and other accommodations on Crete. In our opinion the best overview is at Booking.com. You can sort accommodations by price or display only accommodations in certain cities. The hotels can be booked quickly and easily on Booking.com, there are also many holiday apartments. 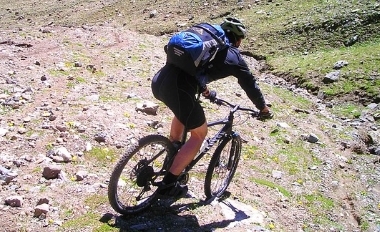 Crete is a very mountainous island, making for challenging cycling terrain. There are many smaller roads with little traffic. Any cyclists in Crete will be foreigners – Greeks are not big cyclists. There are no bike-lanes anywhere in the cities or out of town. Cycling in the cities is a nightmare, but exhilarating in more remote areas. There are thousands of miles of road ranging from flat to high mountain roads. Flat roads are harder to find than steep mountain roads. The best months to cycle are April, May and October. Winter is not too bad for cycling, but it rains a lot. In the summer, the temperatures and fierce sun making cycling very hard work. Taxis are cheaper than in Britain. 100km in a taxi costs approximately €70. Hitchhiking in rural areas is easy and far less dangerous than Northern Europe. The big problem is drink driving and speeding, which is more prevalent on Crete than the mainland. You can rend vehicles from almost anywhere, though you’ll get a better deal over the internet. Normal prices for a small car are €25 to 35 for a day, €45 to 60 for two days or €150 for one week, though prices vary according to season and demand. In high saison these prices can be higher, off saison even lower (prices from 2019). In tourist areas you can find ‘road trains’. They can act as public transport in smaller places, but on the whole they’re used to drive tourists around to see the local sights or beaches. They are not particularly cheap. All infos ybout Pompeji Italy and about the colosseum in Rome.